Jesus told his disciples to stay in the city until this promise of the Father came. This is what we are doing at IHOP: waiting in prayer for the promise of the Father. However, in prayer we are doing so much more then just casually “waiting”. The Greek word translated as “stay” in the NIV in this verse is kathizo. It can also equally mean, “to make to sit down, to set, appoint, to confer a kingdom on one” (Thayer’s Greek Definitions). 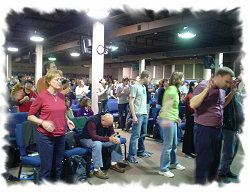 We are prevailing in prayer awaiting the kingdom that is to come but is now here. I am longing for the day when these seven men and many others like them will be healed testifying to the Kingdom of God and the coming ruler-ship of Jesus over the nations of the earth (See Revelation 11:15). 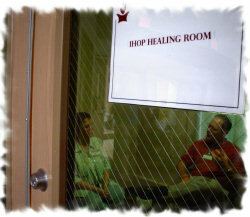 Earlier this year, I began working in the healing rooms at IHOP. These rooms are positioned in the back of the prayer room and are open for anyone to come and get prayer for physical healing several times a week. I pray for the sick every Wednesday from 6-8 pm. It is so incredible to partner with Jesus in having compassion on the sick. I have really encountered His delight many times as I have prayed for our clients. The Sick Are Healed: Blind Eye Opened! Since our fast in March, we have seen an increase in healing. 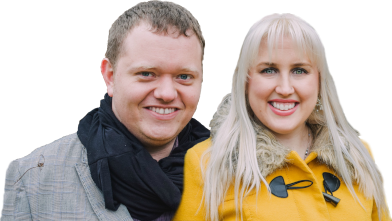 In April at our Healing Staff Meeting we had five testimonies of eyes being healed. Among them was a man who had one blind eye. One of our high school aged girls prayed for him, and his blind eye was opened. He can now see! Another lady had 2 nodules on her thyroid. Before she let the doctors test them to see if they were cancer she wanted to receive prayer. So, she came in and we prayed. She went back to the doctor and had him run another test. The nodules were gone! There was also someone who had a tumor on her kidney and after prayer she went back to her doctor to run another test and the tumor was gone! At our Sunday service, we had another man diagnosed with lung cancer that had severe pain in his chest since the cancer had been there. The pain left on Sunday morning. He was crying, with his family, for he had not had relief of pain for quite some time.